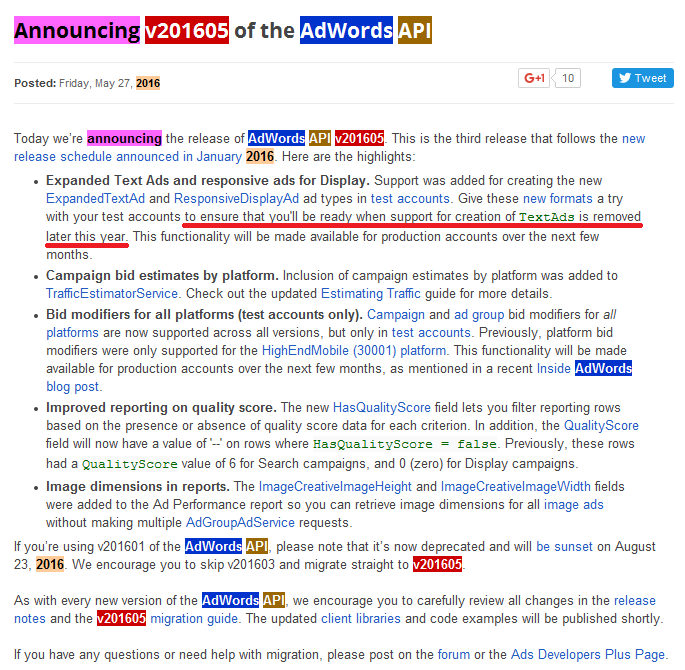 Last week, Google announced v201605 of the AdWords API. The highlights included an interesting part about Expanded Text Ads – until it was removed from the announcement. Give these new formats a try with your test accounts. Give these new formats a try with your test accounts to ensure that you’ll be ready when support for creation of TextAds is removed later this year. This isn’t really a surprise, but it’s another clue that Google is serious about their new expanded ad format. This could mean that text ads are going to be phased out completly later this year. However, I doubt that they’ll risk losing lazy advertisers who never bother to do anything new with their accounts. My interpretation is that Google will only remove the ability to create regular text ads, both in the API and in the user interface, making sure that new ads will always be created in the new format. Maybe there will be a forced migration at some point, but in theory, nothing stops Google from using regular text ads as backfill. There was another interesting thing in the announcement: With the new API version comes a report field that tells you whether a keyword actually has a Quality Score. Right now, keywords get a 6/10 until they get their “real” Quality Score (which could be a 6/10 again). This might be interesting information for advertisers and I’ll probably make use of it in the next version of the Quality Score Tracker. 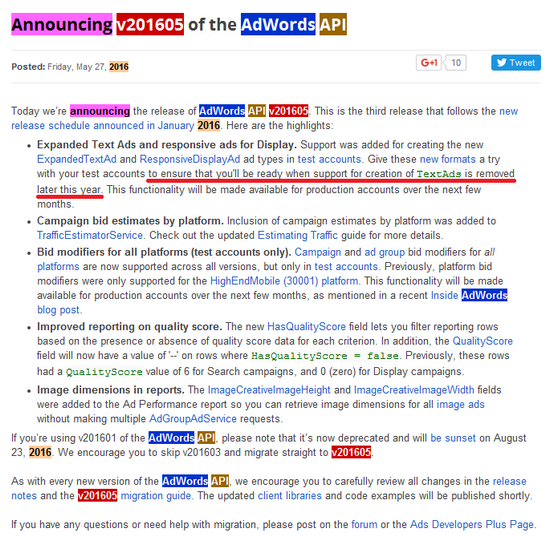 While API announcements are mostly technical, they sometimes have interesting bits of information about upcoming changes to AdWords. Two years ago, I found out about Upgraded URL’s, about eight months before they became a big thing. Even if you’re no developer, I believe Google’s Ads Developer Blog should be on every PPCers reading list. This entry was posted in News by Martin Roettgerding. Bookmark the permalink.